Indian blogosphere is raining with Diwali recipes. I hardly get time to prepare dishes for Diwali these days due to busy work schedule. However, I have few recipes at hand which I prepared during Pooja holidays. We can make use them for Diwali too. Starting the first entry with Sweet recipe - Sabudana Kheer / Javvarisi Paysam (In Sanskrit and Hindi : Kheer and in Tamil : Payasam). One might observe that payasam is slightly thinner than kheer. But I found both to be similar but called by different names. My mom prepares this dish often during special days like birthdays, wedding anniversaries, fasting days and almost during all festivals. I had prepared this dish during Navarathri. Sometimes, my mom mixes sabudana with vermicelli and prepares it. Since I had posted the vermichilli kheer previously, now I prepared this kheer only with sabudana. 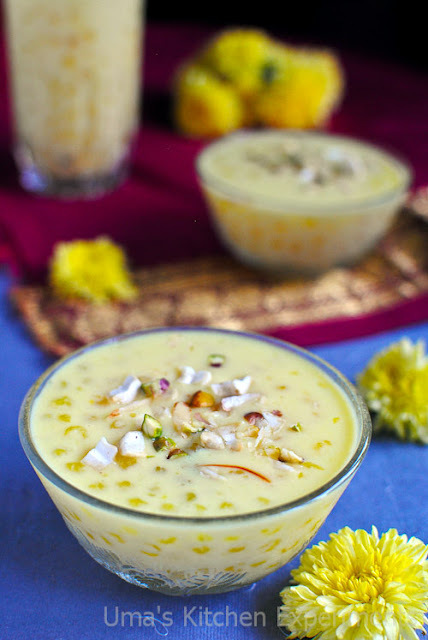 There are many variations/methods to prepare this kheer/payasam and it differs from family to family. Few add water to cook the sabudana and few won't add saffron for making kheer. Anyway, you will get very slight change in taste in the final recipe. This is how we prepare sabudana kheer at our home. Hope you like it. 1) Wash sabudana in running water and soak it for an hour. Depending upon the size of sabudana the soaking time differs. Drain the water after an hour and keep it aside. 2) Boil milk in a wide, thick bottom vessel. Boil it till it slightly thickens. Continuously stir to avoid overflowing of milk. The whole process will take around 7-12 minutes. 3) Add sabudhana and cook till it become translucent. Press it in between your fingers to check whether it is cooked or not. 4) Reduce the flame to low and add sugar and crushed cardamom. Mix it well and cook till the sugar completely melts. 5) Meanwhile, roast the nuts (Cashew nuts, Dry grapes, Pistachios and Almonds) in ghee to golden brown and keep it aside. 6) Add crushed saffron to the milk. 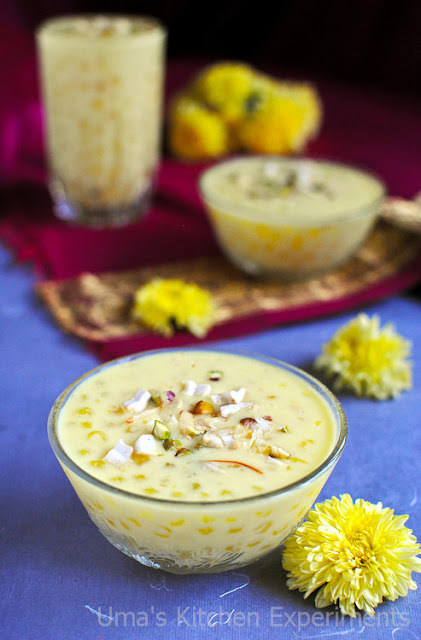 You can also soak saffron in warm milk for few mintues and add it to the kheer instead of adding it directly. 7) Add roasted dry nuts and mix well. 8) Turn the flame off. Serve this dish warm or chill as you wish. Garnish with dry nuts before serving if required. I added roasted cashew nuts and dry grapes to the kheer and used crushed Pistachios and Almonds for garnishing. 1) If you don't like to add crushed cardamom to the kheer / don't have cardamom powder in your pantry, just grind the cardamom seeds using a mixer with sugar and make a powder of it. By this way, you can avoid cardamom pieces getting stuck in your mouth while you enjoy the kheer. 2) Increase or decrease the sugar quantity based on your taste. 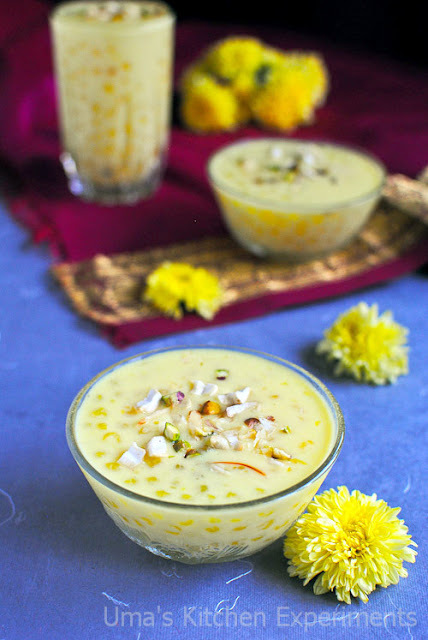 Yummy Payasam.. Love the clicks..
inviting clicks uma.. i like vermicelli kheer more than sabudana kheer..
Looks absolutely divine, creamy payasam just makes me drool. 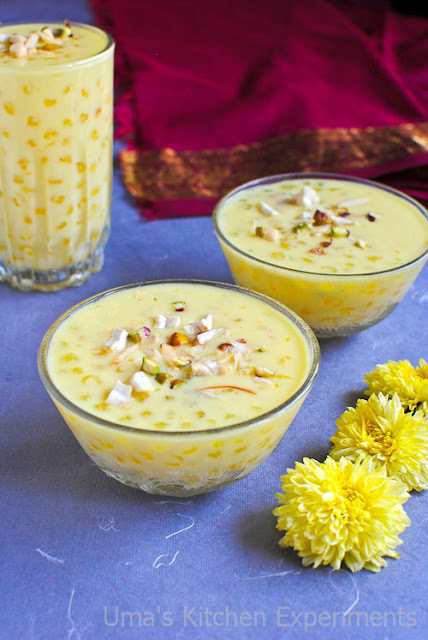 Kheer looks so delightful and yummy one !! Are you using white sago? Its turned out well.